On June 18, 1812, Congressman John Randolph told a group of Congressional war-hawks after their overwhelming vote to declare war on Britain, "Gentlemen, you have made war -- you have finished the ruin of our country -- and before you conquer Canada, your idol [Napoleon] will cease to distract the world, and the capitol will be in ruin." Although the war did not ruin the United States, Britain did burn the Capitol two years later in 1814 after Napoleon's exile freed British troops for duty in America. In fact, it was John Randolph who dubbed the pro-war congressmen "war hawks" in the first place. This as yet un-installed roadside marker (FR-28) outlines the story. The War of 1812 sparked intense opposition, particularly among members of the Federalist Party who unanimously opposed the June 1812 declaration of war. 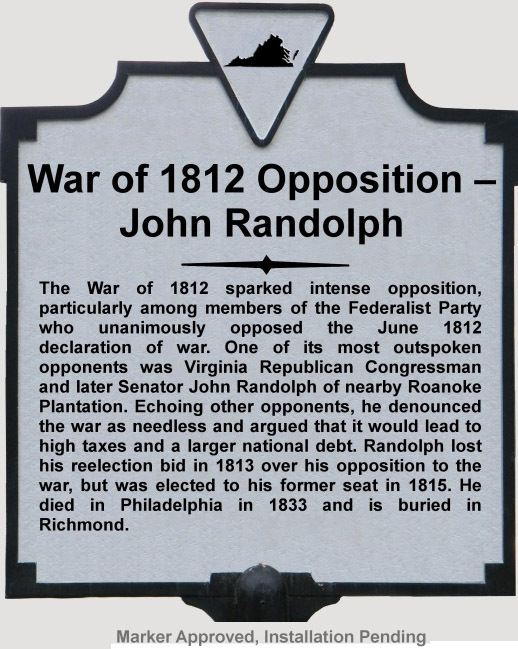 One of its most outspoken opponents was Virginia Republican Congressman and later Senator John Randolph of nearby Roanoke Plantation. Echoing other opponents, he denounced the war as needless and argued that it would lead to high taxes and a larger national debt. 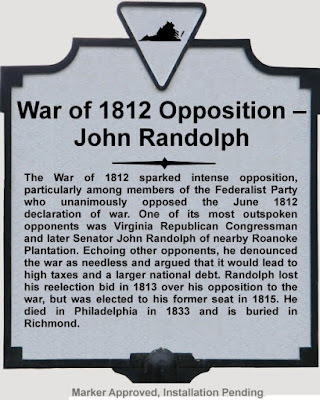 Randolph lost his reelection bid in 1813 over his opposition to the war, but was elected to his former seat in 1815. He died in Philadelphia in 1833 and is buried in Richmond. 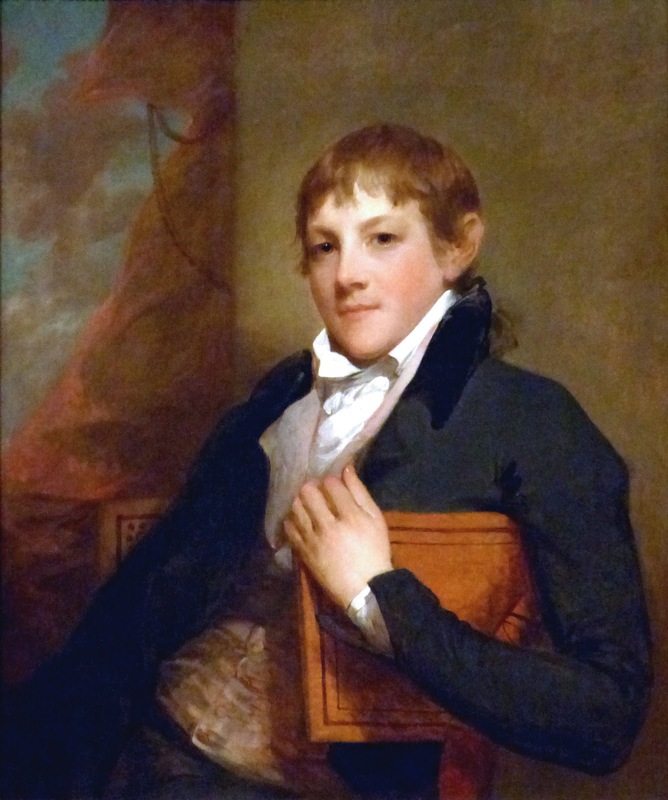 Randolph's youthful appearance conceals the fact that he was 32 years old in 1804-5 when Gilbert Stuart painted this portrait. By this time he had been in Congress for 4 years and was chairman of the Ways and Means Committee. 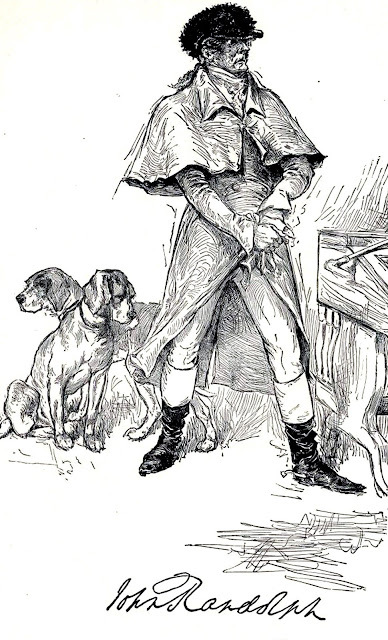 Randolph's small head, raised shoulders, tiny waist, and long, thin legs gave him the look of a crane, and appearance made all the more pronounced by his clothing, usually a swallowtail coat adorned with a white cravat in which he would bury his neck.Randolph was a bitter misanthrope, known in Congress as rude, merciless, and venomous. 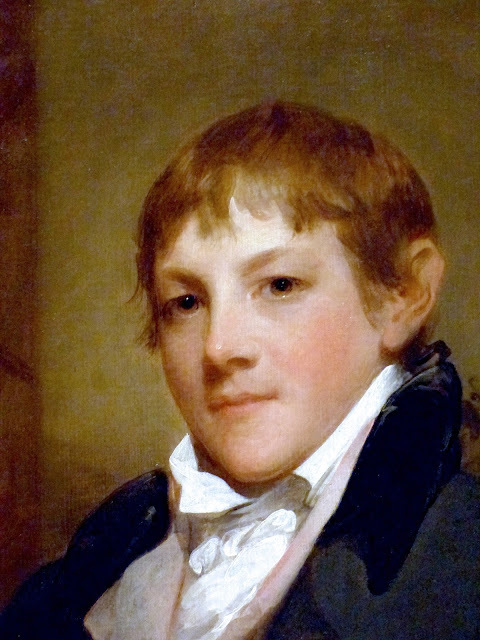 This portrait by John Wesley Jarvis captures Randolph's still youthful appearance in 1811, on the eve of the War of 1812. Randolph was a close friend of fellow Federalist Francis Scott Key. When Randolph lost his seat after opposing the war, he left Washington in April of 1813 so quickly that he left behind "books, letters, papers &c. in (and out of) an open trunk; also a gun, flask, shot-belt, &c." in his rooming house. He wrote Key and asked him to hold on to them. Key later wrote Randolph in September to say,"My Dear Sir, T'was thinking of your gun a few days before I received your letter, and determined to rub off some rust, and try if I could kill Mrs. Key a bird or two. She has just given me another son, and of course deserves this piece of courtesy." 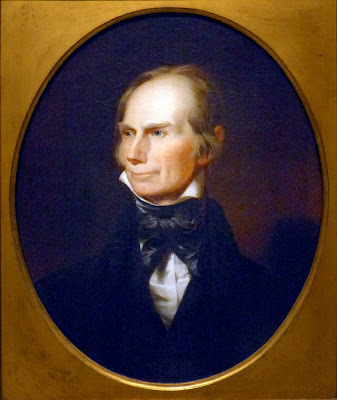 Randolph's nemesis in Congress was fellow Virginian Henry Clay . When Clay became Speaker of the House in 1811, he forbade Randolph to bring his hunting dogs to the floor of the house as had been his custom, but their enmity went deeper than that. Randolph considered Clay corrupt. He famously called Clay, "a man of splendid abilities, but utterly corrupt. He shines and stinks like a rotten mackerel by moonlight." Relations between Randolph and Clay turned violent when Randolph called Clay a "blackleg" on the floor of the house. (A blackleg is a cheater at cards.) Normally, remarks made on the house floor were exempt from challenge under the "Code Duello" of the time. 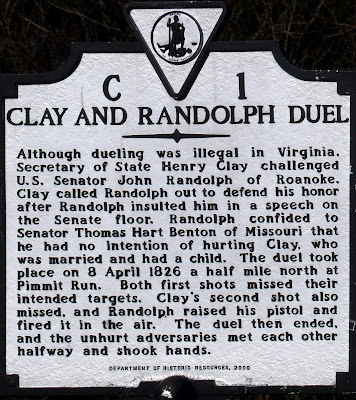 But Clay, believing that Randolph had waved that defense, challenged him to a duel. They agreed to meet in Virginia because Randolph claimed only the soil of Virginia was worthy of his blood. 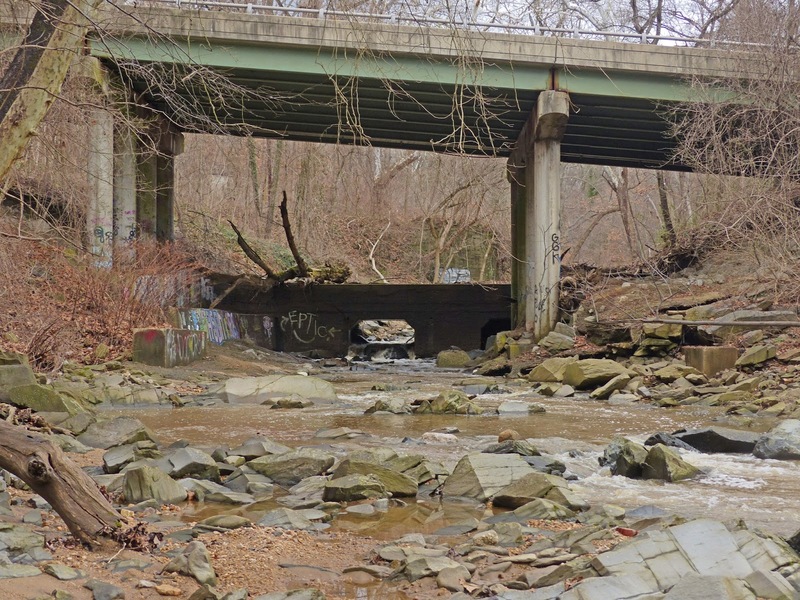 The duel took place on April 8, 1826, at Pimmit Run, just over the Chain Bridge from Washington in Arlington. Another Virginia historical marker tells the story. Although dueling was illegal in Virginia, Secretary of State Henry Clay challenged U.S. Senator John Randolph of Roanoke. Clay called Randolph out to defend his honor after Randolph insulted him in a speech on the Senate floor. Randolph confided to Senator Thomas Hart Benton of Missouri that he had no intention of hurting Clay, who was married and had a child. The duel took place on 8 April 1826 a half mile north at Pimmit Run. Both first shots missed their intended targets. 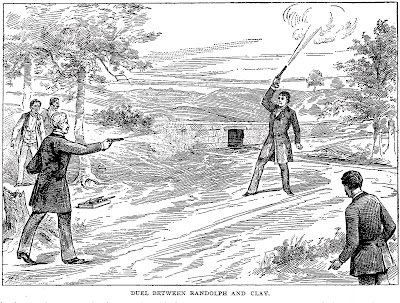 Clay's second shot also missed, and Randolph raised his pistol and fired it in the air. The duel then ended, and the unhurt adversaries met each other halfway and shook hands. The duel proceeded almost comically. 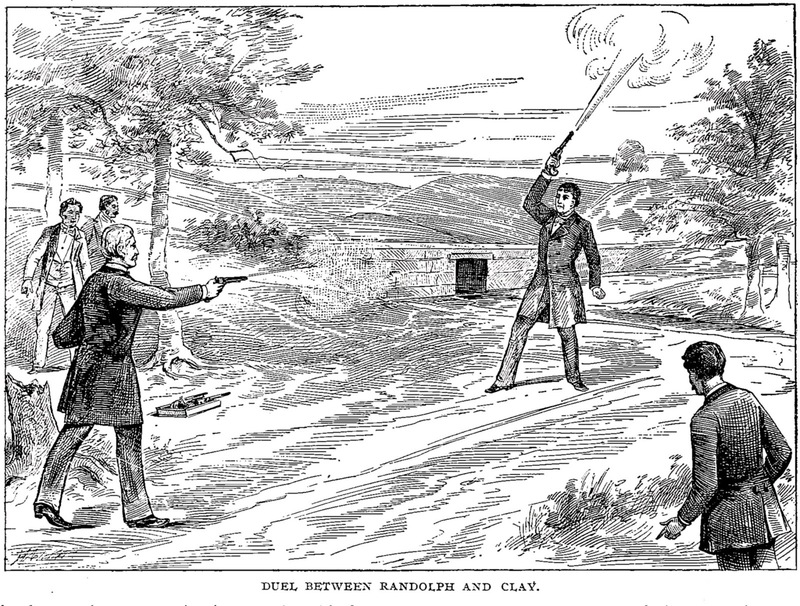 Randolph accidentally fired his pistol before the duel began when he inadvertently touched the hair-trigger. Although Randolph had expressed an intent not to fire at Clay, he was unnerved by the mis-fire and on the first round did fire at Clay. Both Clay and Randolph missed on the first round and, proclaiming themselves unsatisfied, went on with the second. 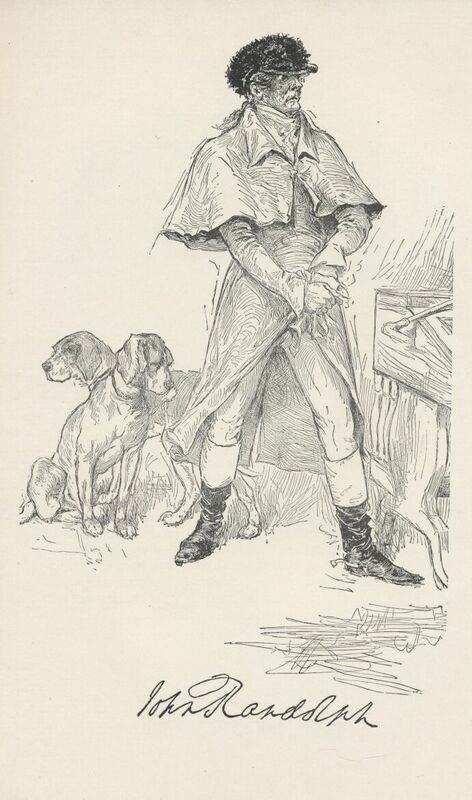 On the second firing, Clay put a bullet through the skirt of Randolph's expensive coat, and Randolph made the grand gesture he had originally planned on, firing into the air and saying, "I do not fire at you, Mr. Clay." 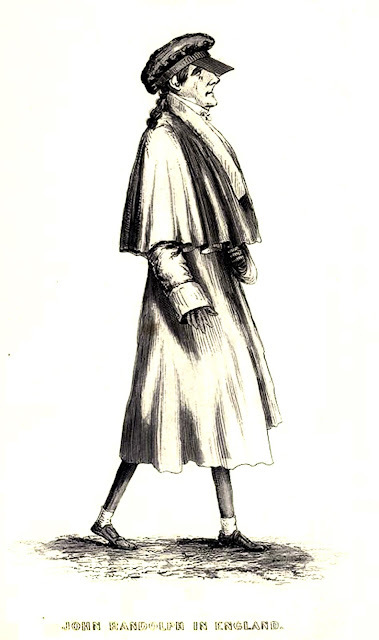 When met half-way to shake hands, Randolph remarked, "You owe me a coat, Mr.Clay." Clay replied, "I am glad the debt is no greater." John Randoph's dueling pistols can be seen in the Virginia Historical Museum. They say these may have been the pistols used in the duel with Henry Clay. 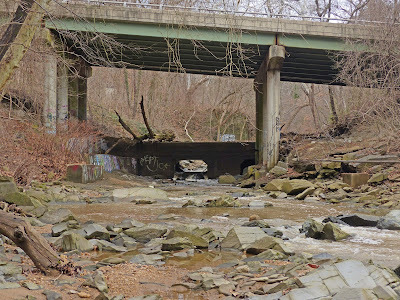 While it's not clear, to me at least, exactly where the duel took place, this dam on Pimmit Run under the modern-day (1928) Chain Bridge looks like the one in the 1893 illustration above. Modern conservatives reluctantly recognize Randolph as a forebearer. After all, he opened his public career in 1799 with a debate at Charlotte Courthouse against Patrick Henry in which he defended the position that the Federal Government has no right to impose laws on the states. It was Henry's last debate and Randoph's first. "John Randolph of Roanoke was everything the modern conservative might despise: aristocratic, sexually ambiguous, occasionally irreligious, anti-party, and the sworn enemy of military adventurism. His personality suggests he might have had more in common with the late Gore Vidal than Sarah Palin. Yet Randolph still stands out as one of the most important conservative thinkers of the generation after the Founding Fathers." K. A. Muston wrote in the Daily Kos that "The man represents the tap root of two great branches in American conservative politics, patrician conservatives and gay conservatives; because if John Randolph wasn’t gay, then neither was Roy Cohen." The article below appeared in various newspapers in 1903. Perhaps the portrait in question is the 1811 portrait above. "When I was in Richmond a few days since," said Mr. Ridgely Howard of Baltimore to a representative of the Washington Star at the New Willard, "I made one of those bad breaks which prove so embarrassing. I was a guest of a member of the crack Westmoreland club, and after a slight repast I was escorted through the building for the purpose of viewing the pictures, relics of the civil war, -etc. During the tour mentioned my attention was particularly attracted to the portrait of what I took to be a very handsome brunette. I incidentally remarked to my host that the young lady was quite pretty, when, with a low chuckle, he replied, 'Yes, quite pretty, but as a matter of fact the picture represents John Randolph of Roanoke at 18.' You also smile, but let me explain how I was caught. The hair was parted in the middle and neatly combed back of the ears; the features were of a purely feminine mold, and the expression of the eyes and face was so shy and bashful that you will readily understand how I was deceived. One can hardly conceive, looking at the portrait of Randolph at the age represented, that he could ever grow into the cynical and disagreeable creature he is reported to have been in his later years. If he ever had love affairs which went wrong I have never heard of them. As near as I can learn he never had any real ardent affection for any woman except his mother, who, it is said, was beautiful, and whom it is also said he closely resembled in beauty as a child. "Later in the day I paid a visit to Hollywood cemetery a beautiful spot, and sought the grave of Randolph. I found it on a gentle slope overlooking the James. It appears that some twenty years ago, or more, the remains of Randolph were moved from the lonely spot in the forest at Roanoke to their present resting place by the state authorities. A marble slab now covers his last resting. place, on which is the following inscription: 'Here lies John Randolph of Roanoke.' The only other words on the slab are those giving the date of birth and death." The claim that Randolph of Roanoke never had "real ardent affection for any woman except his mother" is not fully contradicted by Robert Douthat Meade's description of Randolph's engagement to Mary Ward who later married John's brother Edmund. John Randolph suddenly and inexplicably called off the engagement in 1799. Meade believes the engagement was broken off because of Randolph's physical impairment. It seems Randolph was not gay, he was more or less asexual due to his lack of physical development. Stanley quotes Bill Kauffman that “Dr. 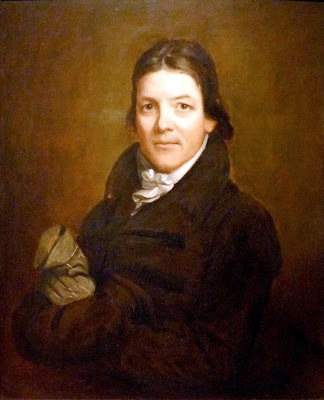 Francis West conducted a post-mortem examination of Randolph and recorded that the ‘scrotum was scarcely at all developed,’ with only a right testicle ‘the size of a small bean.’” We might say that John Randolph of Roanoke was neither a heterosexual nor a homosexual but falls somewhere else in the LGBT spectrum. As a postscript, I'll note that John Greenleaf Whittier wrote a poem about John Randolph of Roanoke, the most quoted verse of which refers to his Virginia oriented patriotism. Stoop o'er his Old Dominion!"